The opal is a precious gemstone with wonderful bright rainbow colours which flash with the light. Like other gemstones such as diamonds, rubies, sapphires, emeralds and pearls, opals are admired for their great beauty and are used in jewellery such as rings, necklaces, earrings and bracelets. Australia produces over 90% of the world’s opal and in 1993 the opal was officially declared as Australia’s National Gemstone. In this podcast I would like to tell you a little about this famous and beautiful gemstone. There are different types of opal. Black Opal has a largely black background from which the rainbow colours flash. By contrast, White Opal has a largely white background from which the beautiful rainbow colours flash in the light. Boulder Opal is slightly different, as it has some ironstone at the back of the opal, but still with the bright sparkling colours coming from the stone. Opals are mined in the outback of South Australia, New South Wales and Queensland. Each location produces certain types of opal. Coober Pedy in outback South Australia is one of the most famous opal mining towns. It is located 846 km north of Adelaide, in outback desert country that is hot, dry and harsh. Because the town is so hot, some houses are built under the ground and are called ‘dugouts’, as they are actually dug out from the rock. Coober Pedy is most famous for White Opal. By contrast, Black Opal is the most valuable opal and is mined in Lightning Ridge in outback New South Wales. Lightning Ridge is 740km northwest of Sydney. Boulder opal is also very beautiful and is found in western Queensland. The most famous opal towns in Queensland are Jundah and Quilpie. Opals are truly amazing gemstones to look at. The colours are so bright and sharp. The greens, red and blues are vibrant and dazzling. It is like a set of Christmas lights are trapped in the rock. When you move the gemstone in the light, you can see the beautiful colours flash and sparkle. When an object allows light to pass through it, but the light is changed, we say the object is translucent. Opals are translucent. This is different to transparent, which is when light can pass through an object without being changed. Glass is transparent, but opals are translucent. This is what gives them their beauty. The life of an opal miner in outback Australia is tough and can be dangerous. Mines can go deep into the ground and sometimes a mine can collapse, trapping, injuring and even killing the miners. But even with the danger associated with opal mining, these hardy people are happy to live the life of an opal miner. They become fascinated with opal gemstones and the idea of striking it rich. That is why they are prepared to go out into harsh and inhospitable desert areas in order to dig for the precious gemstones. While I can understand the attraction of striking it rich on the opal mining fields at Coober Pedy or Lightning Ridge, I think the tough life out there is not for me. I’ll leave that to the more adventurous Australians among us. My wife has always loved the look of opal gemstones. 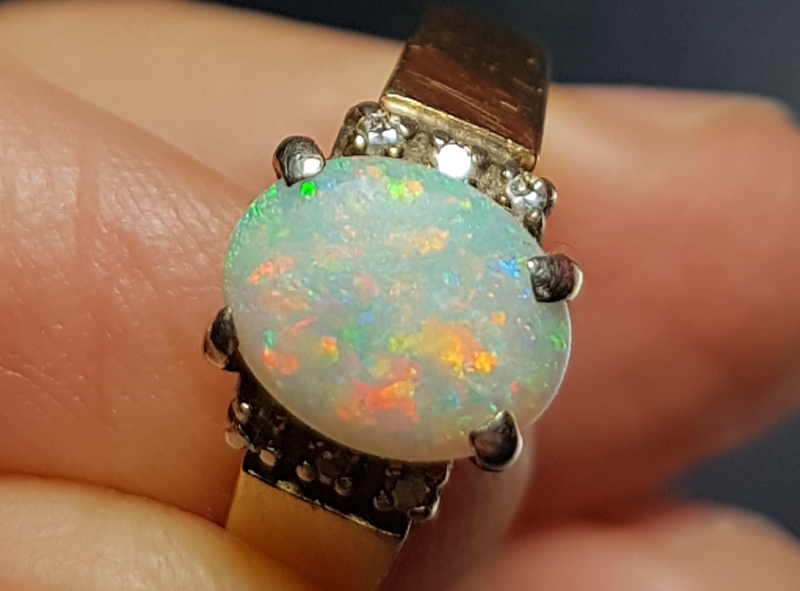 She decided that she wanted an opal in her engagement ring when we decided to get married in the mid 1970s. The normal gemstone used for engagement rings is diamond. Diamonds are certainly more precious and cost more than opals, but there is something quite different about an opal engagement ring. The beauty is unique and unmistakable and they are typically Australian. I was very happy with her choice of gemstone and the engagement ring still has natural beauty after more than 40 years. One point to note about opals, especially compared to diamonds, is their softness. While diamonds are the world’s hardest material, opals are much softer. In fact, when worn as jewellery on the hand, there is a chance they can get bumped or knocked on something and they can break or chip. It is therefore recommended that an opal ring should be removed if the wearer is doing something active, such as gardening or cleaning, when there is a high chance that the gemstone might get knocked and be damaged. After all this time, I still get a kick out of looking at my wife’s opal engagement ring. Not only does it bring back great memories, it is still beautiful to look at. Podcast 109 Quiz - Did you understand the podcast? True or False? – Australia produces more opal than any other country in the world. True or False? – Rob thinks that opals have colours like in a rainbow. True or False? – White opal is called white because it has a white background. True or False? – If you lived in Coober Pedy in South Australia then you might live underground. True or False? – Black opal is mined in Queensland at Jundah and Quilpie. True or False? – Opal is transparent and that is why it is so beautiful. True or False? – Opal miners are fascinated by opal and the idea of striking it rich. True or False? – You have to be tough if you want to mine Opal in outback Australia. True or False? – Rob’s wife has a diamond engagement ring. True or False? – If you wear an opal ring, you should take off your ring when you are doing something active with your hands, like gardening. pearls = a precious white coloured ball found in clam shells or made by man.